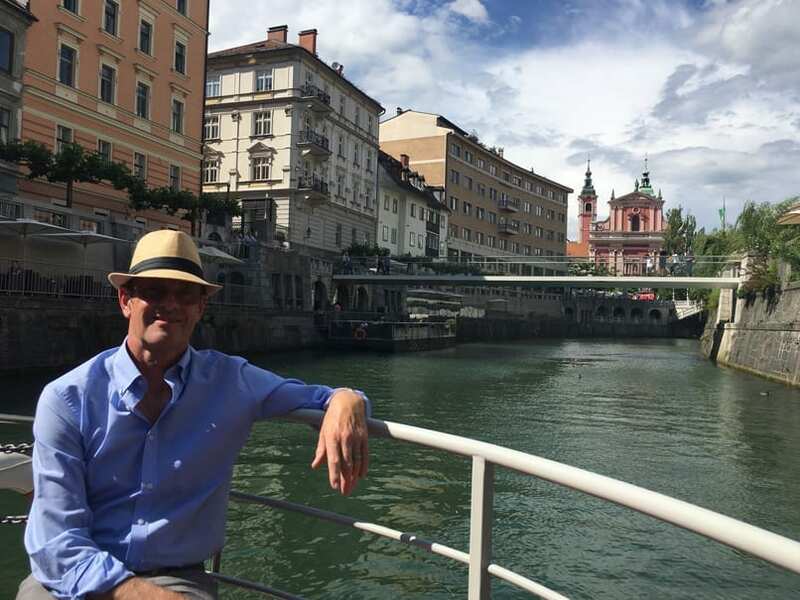 I love the collection of striking architecture, the richly painted churches and the abundant greenery along with the vibrant cafes and bars lining the willow-fringed banks of the river, The friendly people and the great atmosphere. Am I gushing too much? Well, I think this city deserves it and I hope my photos do it justice. 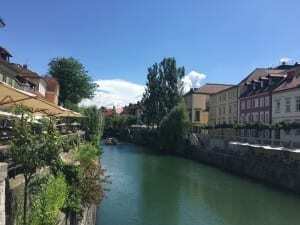 Ljubljana Old Town is a small beautiful city oozing charm. 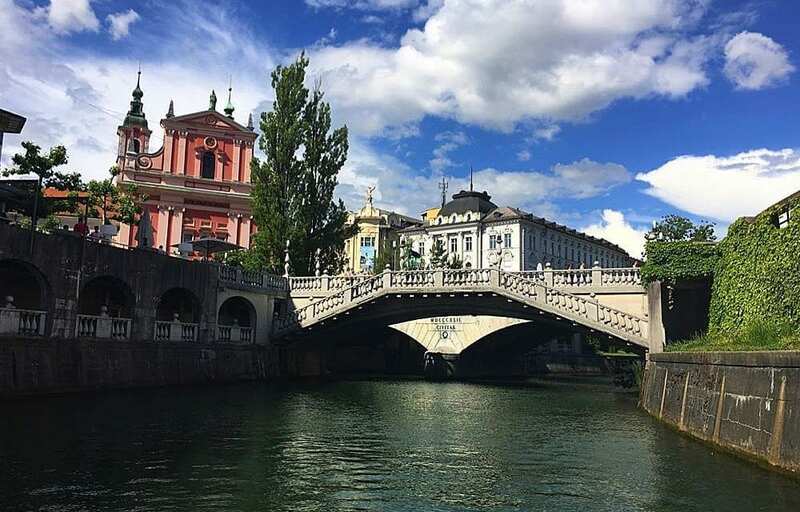 Ljubljana is the capital of Slovenia and is a city not to be missed if you are in Slovenia to visit Lake Bled. It’s not far from Lake Bled probably only 30-60 minutes away. 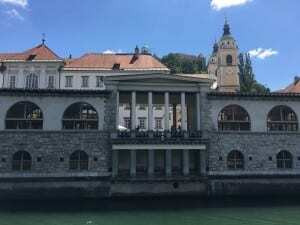 You can get a train or do a coach trip from Bled. 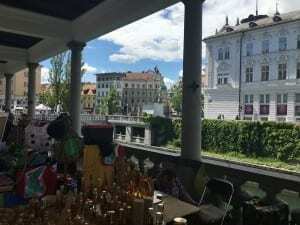 We found that a Friday is a good day to visit this city because they hold an open food market from morning till night which is great to experience and they have local entertainers on the bridge. We heard that a Sunday is a nice day to visit too with the antique market set up along the river. We got a bus into the city from right outside our campsite. You have to purchase a card from reception for 2 euros then load the card with your fare. 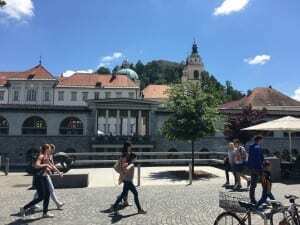 The cost of a one way trip to Ljubljana was 1.60 euros each. When you leave the site you can hand the card back and get a 1euro refund. We were lucky as there must have been some money left on our card from the previous cardholder, although we didn’t realise this until we tried to load it at a kiosk before our return. Although we had put enough on for a return trip, unfortunately, we went several stops past our bus stop and were on our way out of the city, going goodness knows where. The campsite receptionist told us to look out for a tree-lined street with a bust at the end. Well, all the streets looked tree-lined and we didn’t notice a bust. I should have gone with my instinct when I thought we were near the city but we stayed on as we thought it would be obvious where to get off. – It wasn’t until we could see we were definitely coming out of the city that Ray spoke to the driver and he told us to get off at the next stop and get the bus back in. This then panicked us as we knew we had only loaded the card for 2 return trips and was not sure how to load the card up again. As it happened the ticket is valid for 90 minutes if you change buses, so we would have been ok but found out when we tried to re-load it at a kiosk that in-fact we had enough for 3 trips on it. Obviously left over from the previous card holder. When we got off the bus, although we had a map we had no idea where we were on it and which direction to take. Luckily we chose the right direction but as we were in the newer part of town it didn’t look anything special like any other town so we weren’t very impressed and wondered what all the fuss was about. 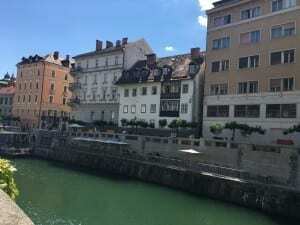 Eventually, as we walked we came to the river and the old town and WOW! 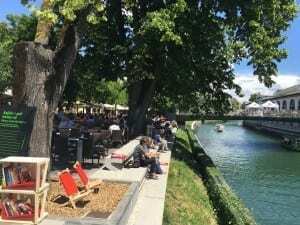 It was absolutely buzzing with lots of people sitting outside the many bars/restaurants lining the beautiful river. We crossed the river on the Butcher’s Bridge which has become quite famous. 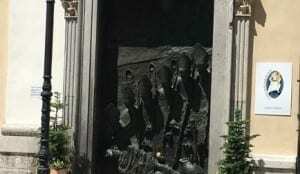 Not only because of the decoration with works made by the sculptor Jakov Brdar but mostly because it became a ‘love bridge’. Not long after it opened in July 2010 people started to hang locks on it. Different kinds of padlocks of couples in love started appearing on its steel wires, symbolising declarations of eternal love. 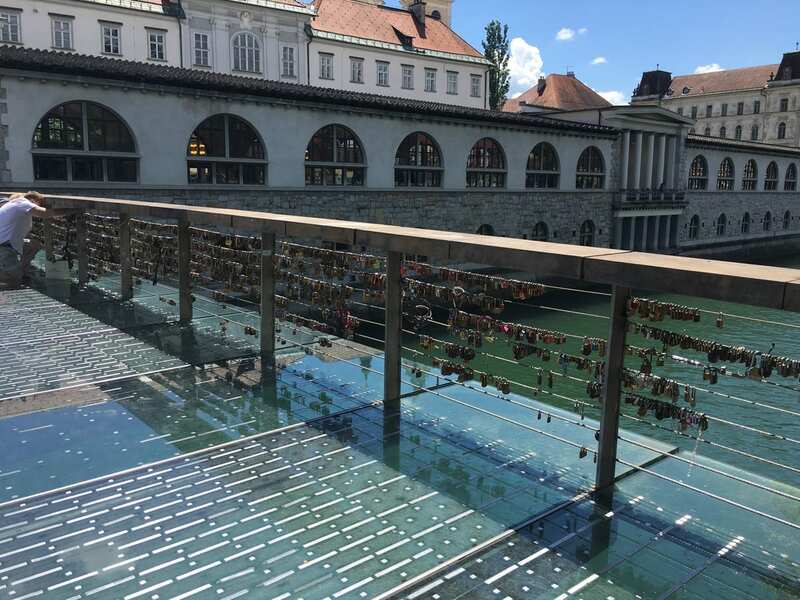 Apparently more and more locks appear on it and if you also want to officially confirm your love, you can lock it in Ljubljana. 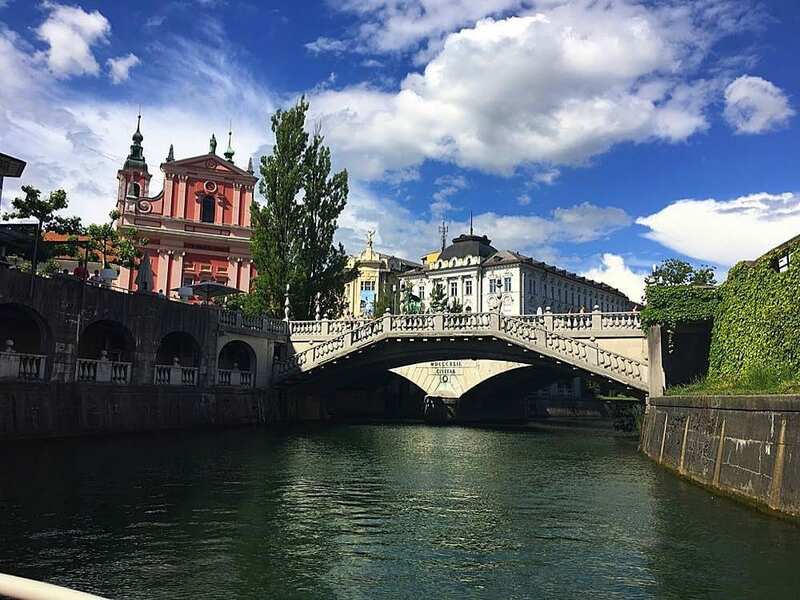 Before throwing the keys into Ljubljana river be sure your love is true – because it can’t be unlocked! You can buy a padlock in a souvenir shop nearby or bring one with you. The floor of the bridge is interesting as it is see-through, and you can see the river below through the glass. There are also a few interesting sculptures on and around the bridge. From this bridge, we walked down a side street into the pedestrianised old town. and stopped off for a coffee. Love the homemade scooter this man made to transport his children. 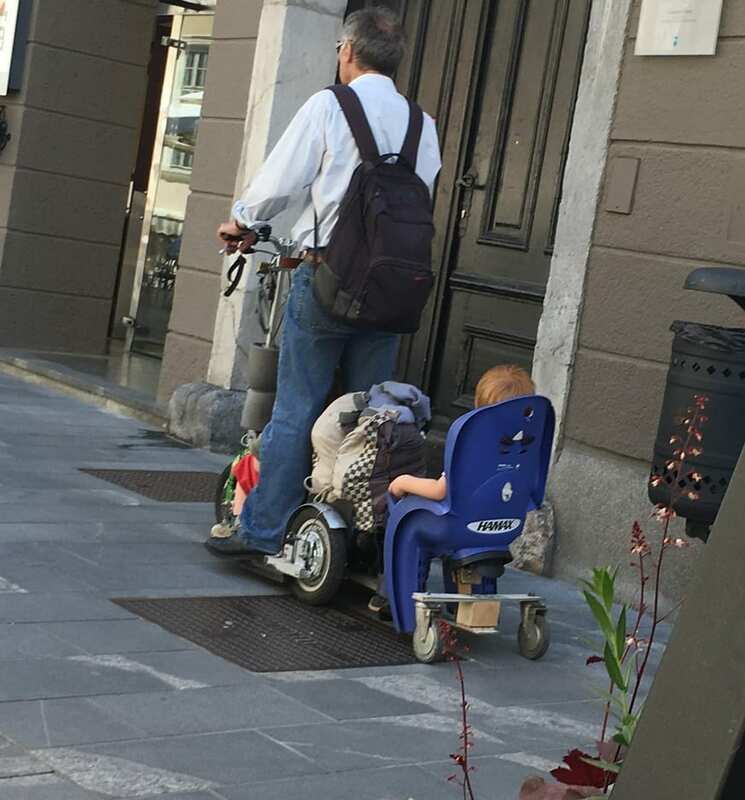 One toddler in front and one behind – what a great idea. I wish now I had got up and taken a better picture rather than after he had gone past. (If the weather is particularly bad, the market may be cancelled). 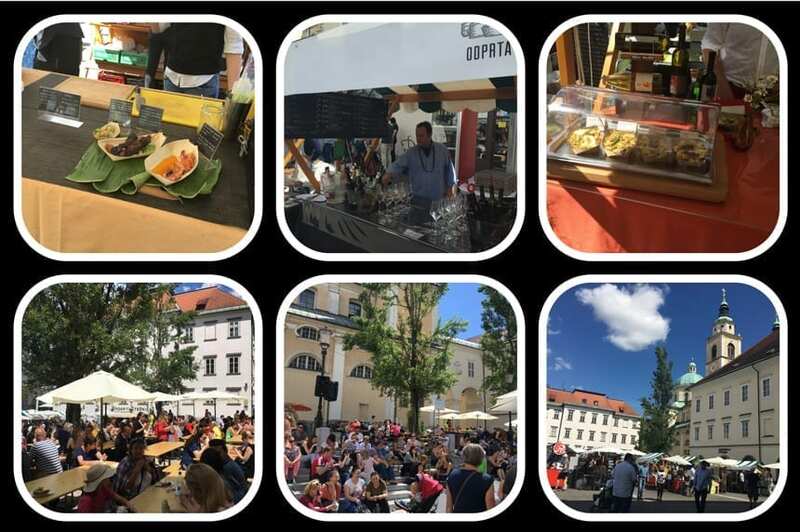 While we were sitting having coffee we were deliberating where to have lunch when we noticed lots of activity down another side street and people walking around eating food – We had finally stumbled on the Open Food Market. I have never seen anything like it. We have enjoyed eating street food in Camden market before but that was mainly Chinese and Carribean but it is nothing like as big as this market. 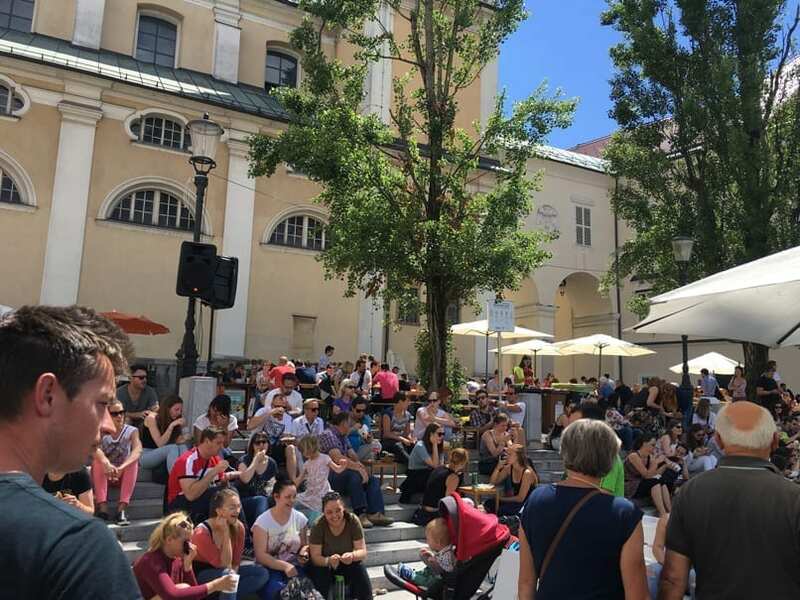 It is so popular and the amount of people it attracts is massive – and a Friday lunchtime too. The street food market offers a fantastic array of cooked foods from many different restaurants. Both local and International food. You purchase your food then take it to the tables and chairs set out above the steps or sit on the steps to eat it. It was a particularly hot day and we were so lucky to get a table with a bit of shade. 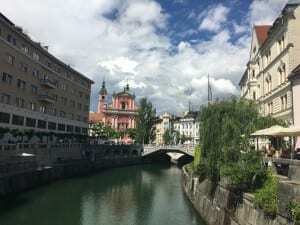 We bought several dishes to share for our lunch, which we really enjoyed, then went back a bit later before leaving Ljubljana for more. It was very inexpensive too. The market is open from morning until about 11 pm at night. 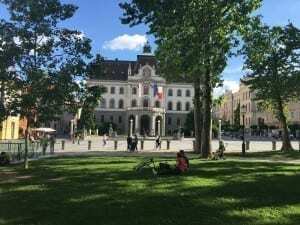 Ljubljana is voted Europe’s Green Capital 2016 and it is most certainly apparent. The city is almost immaculately clean and green. The air is fresh, the rivers crystal clear you can see right to the bottom of it. In the food market, they had a selection of bins for paper, food, plastics etc and they had someone policing the bins to make sure you put your waste in the correct one. It was really refreshing to see everyone clearing up after themselves. Behind the food market is the fresh food market where you can get fresh vegetables, fruit, and flowers. The Central Market runs every day from Monday through to Saturday. There were also stalls selling jewellery, handmade gifts and souvenirs. 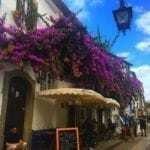 After browsing the stalls we made our way towards the triple bridge which is a very unusual and picturesque bridge in the heart of the town. 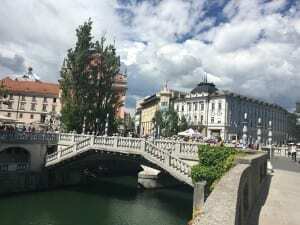 It is the most frequently crossed bridge in Ljubljana. 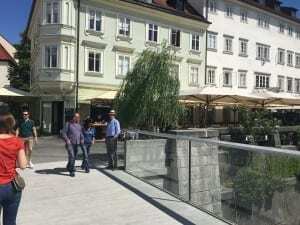 It connects the main square and a newer part of town with the Old town and market. 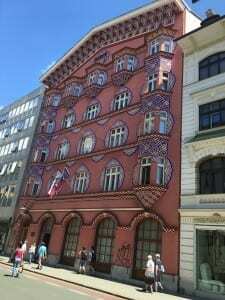 There are many beautiful buildings around in this area which is a traffic-free zone. 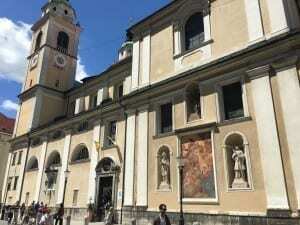 The square is dominated by a beautiful church. 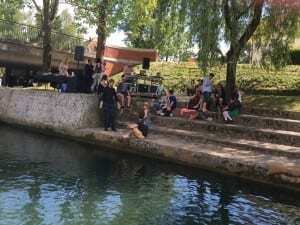 The area is a popular gathering point for young people and is often used for small-scale concerts. There was some sort of festival going on over the weekend so this area was quite busy. By the bridge is a monument of Slovenia’s national poet France Prešeren Trig. If you follow his gaze across the square and you will see the sculpture of his unattained beloved, Juliya. Prešeren Trig. 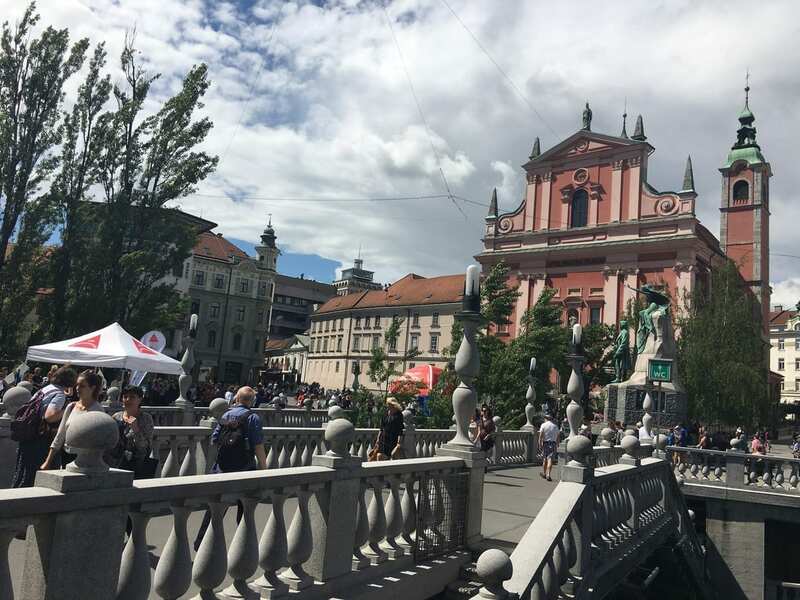 Next to the monument is the Franciscan Church, the Art Nouveau Urbanc house and the Tourist information centre is just across the Triple Bridge. 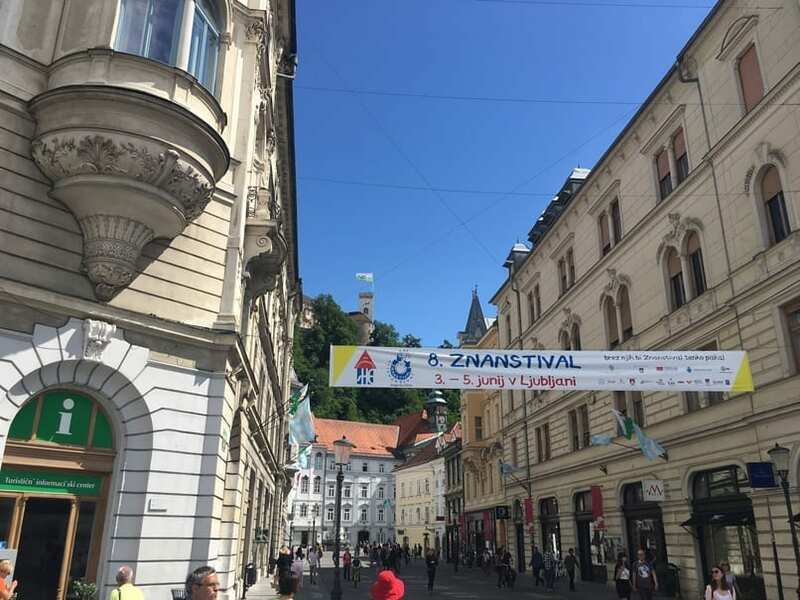 We only found this out the next day but was told It is worth buying a 10 euro tour of the Old Town from the Tourist information centre because you not only get a tour but a sampling of the local food in a typical Slovenian restaurant and you also get a ride in the funicular railway up to the castle as part of the tour. This saves you a few euros than if you had to pay for the ride up yourself. 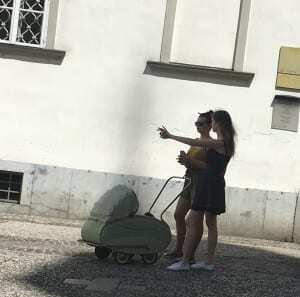 There are little electric golf buggy type vehicles running around the Old Town. They offer free transport wherever you want to go around the Old Town, which is otherwise closed to traffic. 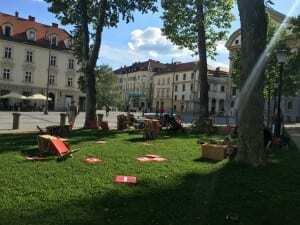 If you want to stay somewhere quirky there is an Interesting former military prison which has been turned into a hostel in the centre of Ljubljana. The rooms are made to feel like the former prison cells. Bit of a strange feeling I should imagine. 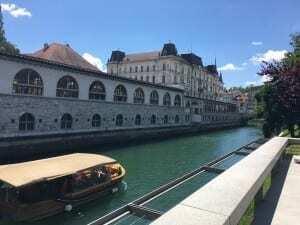 Continuing on from the triple bridge along the riverside we noticed perched up high on the hilltop the impressive 16th Century Ljubljana Castle. The grounds have been given over to a cluster of museums. It offers an outstanding view over the city. If you don’t fancy the trudge up the steep hill you can get the funicular railway. You don’t have to pay to enter the castle courtyard, where you can relax with a cup of coffee or a glass of wine. There are numerous art exhibitions which take place in different parts of the castle and are usually free as well. 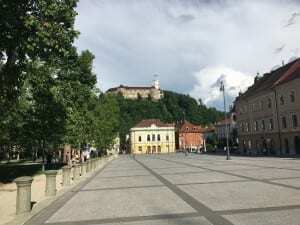 On the other side of the castle, there`s a chapel and a viewing tower together with Virtual Castle, where you can see a documentary about the history of the castle in Slovene, English, German, French, Spanish, Russian, Croatian and Italian. On the left side of the castle chapel, you will also find a Museum of Slovene History and a restaurant serving traditional Slovene food. There are various events happening at the castle in the evenings. 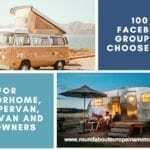 You might find a concert, a theatre show or an open-air cinema of non-commercial movies in the summer. If you are there at the start of September there is a Medieval day, which takes place in the courtyard and around the castle. We didn’t visit the castle this time. We were intending to go back into the city the next day but as the rain was really bad we gave it a miss. We regret now not staying on an extra day to see the castle and to wander around the town a bit more as there were other interesting looking streets we missed. It was one of those places we would be faced with 2 -3 directions we could go in and would choose 1 with the intention of going back to the other street later but not getting round to it as this street lead on to even more interesting areas. 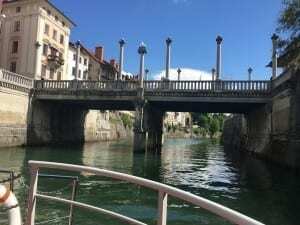 We took a boat rip up and down the river passing under several famous bridges of Ljubljana. The cost was only 8 euros each and was well worth it. As it was a hot day the breeze as we were sailing along was really welcome. We passed by an area along the river bank where deck chairs were set up on the steps and there were bookcases full of books. Another area there were a group of young people a couple of whom were dressed in vintage clothes dancing to music from a music deck they had set up. 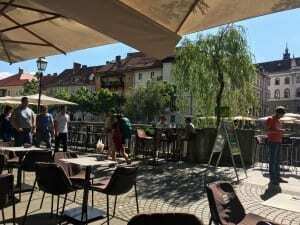 After the boat trip, we went to one of the bars on the riverside and spent a bit of time over a glass of wine watching the world go by including two police officers on horses. 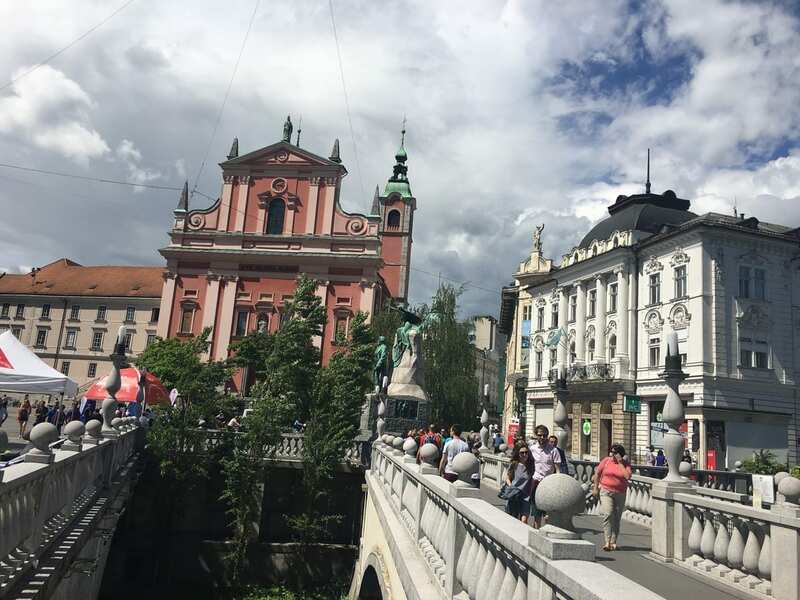 We then walked over the triple bridge and across the square. And eventually ended up in the tree-lined street with a bust (where we should have got off the bus earlier in the day). Feeling tired and hot and with thoughts of coming back the next day to see more, we decided to try and find the bus stop to get back. After a bit of confusion, we had no idea which direction we needed the bus to be going in) we eventually saw the bus coming along on the other side of the road and had to make a quick dash for it. Luckily the bus driver had spotted us when I pointed the bus out to Ray and he waited for us. 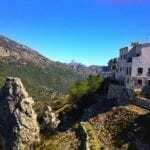 The journey back made us realise how easy it was, once you are more familiar with the area. 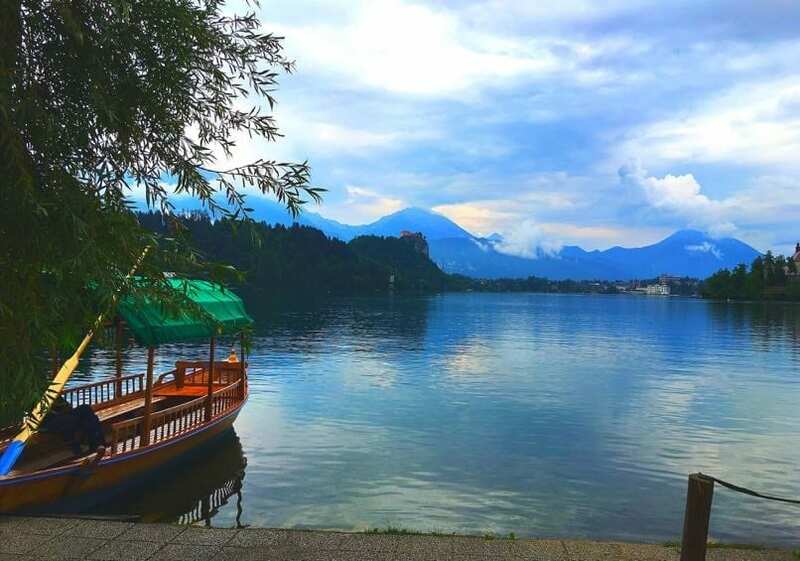 The next day was heavy rain so we decided to make use of the day travelling to Lake Bled as we were so eager to see it. 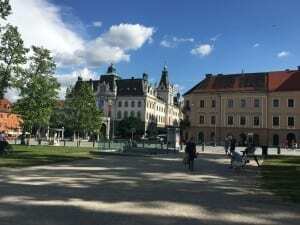 This site is ideal for visiting Ljubljana as there is a direct bus service to the centre. Pitches are a little small and the water in the showers was cold while we were there but the location made up for it.